This is such a terrific stencil. It is in the Folk Art section of our new USA Inspired range of stencils, but I also think it looks very Victorian. It has that busy stylised look so favoured by Victorians. I love these types of designs because I think they make excellent backdrops in any kind of scheme, especially with contemporary or mid-century furniture in a mix and match way. This may be a busy pattern but done in tonal colours, it really is quite neutral. I know that sounds odd, but it works the same way a Persian rug does in so many styles of room. They are always heavily patterned and yet they work anywhere and people don't realise how colourful and patterned they are. This stencil is AM22 Chicago. Decorating children's rooms is a given. I can imagine many people have decorated their childrens' rooms before they got around to decorating their own. It is in aid of putting a bit of fun and stimulation into their little corner of the house. Kids love pattern and colour from as soon as their eyes can focus (do we become more afraid of it as we grow older? That is another blog post perhaps). The problem (or is it?) is that children grow up and quickly. When they are young they seem to hit a major milestone every couple of years. And what worked in the room when the child was a baby, may not be so appropriate when they start nursery, which may not be appropriate when they are well into junior school and on it goes. Redecorating can end up being an expensive endeavour. But there are things you can do to keep that cost down at least. You can either choose something ageless. Something fun, but something that can work with them as they grow. Or you can stencil which can easily be painted out and something else put in its place when needed. This latter option still allows children to have something that is quite specific to their age, but it can be easily changed when they grow out of it. Here we have had some fun with AL7 White Rabbit from our Alice in Wonderland section of stencils and the FNT26 Classroom lettering stencil which is part of our In Your Own Words range. IYOW is a range where you pick the style, the name or phrase you want and the size and we make it up for you. The FNT26 Classroom stencil is particularly fun and the hands come with it free of charge. It has been done on one wall to make it even simpler. When this is no longer needed, just the single wall needs to be repainted and something else can be stencilled instead. This is such a terrific floral pattern stencil. The stylised flowers and added linear effect take it away from being too pretty. We have done it in a very vintage style here with dusky colours so it looks like a pattern that would look at home in american prairie and craftsman houses. But this is also a design that looks terrific in a single colour. Imagine the whole thing in black on a cream wall. Just as we get pleasure from flowers in the garden, we can get the same pleasure from flowers in interiors, only year round. That has to be the reason they are such a popular and consistent theme in decorating. This is AM3 Modern Floral from our new USA inspired range of stencils. There are many definitions of the word classic, but essentially it means of recognised merit; or restrained, balanced, austere; or pertaining to the civilization of ancient Greece and Rome. And that covers all the reasons why it is a decorative style that crops up time and time again through the ages and one that is still popular today although we tend to call modern interpretations "neoclassic". It is a simple, elegant decorative style that immediately elevates any home. It can work in large stately houses or in small townhouses. It can be made to look rich by using darker colours and gold leaf as we have done here, or it can look light and airy done in a pale colour on a pale wall. It has a certainly formality but is not too heavy. This stencil is AM28 Charleston and it is from our new USA Inspired stencil range. Almost good enough to eat. These roses are a bit candy-like which is why we have probably leaned towards using these particular colours. This is pure 1950s novelty print. This is not mid-century as in avant-garde furniture design but rather 1950s full circle skirt with crinoline. It looks great paired with a curvy sofa and it is pure boudoir chic. This one is unashamedly girlie and sometimes (all the time maybe) we need a space just for us. A space to escape to where we can indulge in the prettier things. Boys have their man caves. There is space in between for democratic decorating. So this one is for you ladies. AM15 Roses repeat pattern stencil from our new USA Inspired range. The phrase "Golden Age" can mean different things to different people, but it is widely associated with the 1920s/1930s Hollywood. The film industry was booming and although films were shown in black and white there is no denying that a huge amount of creativity went into sets and costumes and generally creating this glamorous aura in films and with everyone associated with them. Of course, this was around the time of Art Deco which is always seen as one of the chicest decorative periods so the combination of deco and Hollywood was a heady one and one of pure escapism and aspiration for many people. We created this stencil with those two themes in mind. It is quite simple really and again we have made use of dots so that the stencil holds together well. It lends itself well to being stencilled in metallic colours, but really you can do anything you like. We chose to pick out the central dot in another colour, but the design can also be stencilled in a single colour. It is another perfect background stencil that will complement a wide variety of schemes adding a bit of elegance and Hollywood. The stencil is AM7 String of Pearls and it is part of our new USA Inspired stencil range. The premise of a repeat pattern stencil is that you have a section of a design that will repeat to cover a surface. Some of the time, in fact, most often, the repeats are quite regimented. You can easily pick out a single repeat and see how and where it repeats. That is the nature of the design and the way it is meant to be so I do not say that as a fault. But sometimes there is a design where the repeat blends in so well to the next repeat that it doesn't look regimented at all and instead looks free flowing. This new stencil AM29 Willow & Ribbon, from our latest USA Inspired range of stencils is just such a repeat. If you are looking for a more relaxed design that still covers a whole surface, then this is one for you. To add to the look, we have stencilled it in a few colours, softly, so each colour blends nicely into the next adding to the informal look of the stencil itself. When you stare at this, you can pick out the repeat, but you do have to look. We do several versions of paint drips and paint splatter stencils. We just like them and perhaps it is the naughty child in us, but there is still something quite irreverent about paint splatter. This is our latest, AM4 Total Pollocks, a multiple overlay pattern from our new USA Inspired range of stencils. We have done other paint splatter repeats, MD41 Paint Splatter for example. MD41 is a single layer and you stencil it in one colour, then twist it and overlay it and stencil in another and keep doing this as many times as you like. Or you can use a single colour each time you overlay it and again do this as many times as you wish until you get the density of drips desired. AM4 Total Pollocks takes this further. We have made a stencil with 4 different sheets of drips. And the key to this one is that the final sheet which only has a few drips, is meant to be stencilled in a standout colour. This stencil was designed so you could really recreate something that looks totally random and totally, well, Pollock. To create the effect above, the first three sheets were stencilled in very tonal colours and then the drips on the final sheet were stencilled in burgundy and mustard just in the odd place. Each sheet should be done randomly, there is no right or wrong way to use it. You can twist and turn each sheet about and overlay it. So, like an artist, you "feel" your way through and go on pure instinct. No measuring. We do provide instructions to help you. This stencil is great on clothes, in kids' rooms, on canvas as a piece of art, all over furniture, walls, floors, ceilings....it is a very versatile design. And still a bit naughty. But at least your parents are not going to shout at you for this one. Fancy the ultimate medieval design? Want to really turn your home into a castle? Look no further. This is the best set of pure medieval decoration for your home. We used to have these boys in our small dining room in the past. We stencilled them as we have done here, in black with hints of metallic on off-white walls. It was very reassuring to have them looking over your shoulder and one did feel protected, strangely. But the main point is despite their size and presence, they never overcrowded the space. Lifesize knights in the home, you wonder? In fact, they are quite versatile. They add welcome to a hallway, are great fun in kids' rooms if they love medieval stories and history, are something for the man cave, and guard you quietly in your dining room. These are 5 separate stencils so you do not have to purchase them all. The BR2 arch works like a border. This can be repeated over as many walls as you like if wished. Of if you want to make a scene on a wall as in this photo, they can act as a frame for the three knights (or if you don't want knights, for art or something else). The BR1 Shields can be used as you like. This is just a set of 4 different motifs. As for the knights, BR3-BR5: you do not have to have any knights or even all three. You can have a single knight standing alone or repeated. And love the idea but not the size? This is the large size with 72 inch tall knights. We do all the stencils scaled down to a third with 24 inch tall knights. We have another 'exclusive stencil set' to offer to our readers, newsletter subscribers and social media followers. The new stencils of birds were created to work with the Chinese wallpaper mural set that our students receive on our Chinoiserie stencilling class. However, their size complements many of our Chinoiserie panel stencils. Remember that we can enlarge or reduce the scale of our stencils to suit. The bird stencils can be ordered individually or as a set. I wandered around the house holding them in front of drawers and cupboard fronts. They seem to be a good size for decorating furniture too. For speed, I have just called them Bird No.1 to Bird No.4 but I know either you or I will come up with a much better title for this new, mini collection. Suggestions? I have photographed each one next to a tape measure so that you can see the size. The measurements and the prices are written in the comments section of this blog below. These new stencils are not on our website. They are only shown on our social media, so please contact us in the comments if you need more information. Mark it as 'private' if you do not want your comment to be published. Alternatively, you can email or phone us, or leave a message on our Facebook, Twitter or Instagram pages. I am rather excited about them, I hope that you are too. As part of our new USA Inspired range of stencils, we put together a comprehensive Folk Art section. These designs are more simple and stylised but are no less sophisticated. Their artisan style have a homeliness (in a good way) and accessability factor, perhaps unlike any other decorative style, that makes them work in a variety of schemes. This stencil, AM37 Ohio Repeat, is a lovely all over repeat with a border (vertical) and two floral motifs at its heart (note: these can be used separately). The stripe has always added a bit of formality to decorating (stripes have always been a popular theme in interiors). But here the stripe is a slim border with a wide gap between interspersed by two stylised floral motifs so the whole effect is elegant but not too formal or fussy. We have stencilled it in darker and sludgier colours than you would traditionally see folk art decoration, but the whole effect is still light and it offsets the dark antique furniture well. Folk Art decoration can be rustic, or not, depending on which direction you want to go in. This is one of our new stencils from our USA Inspired range it is called AM17 Arts & Crafts No. 2. There is no getting away from it, this is a busy, dense design. Yes, you can make it more subtle by stencilling it in a tone on tone way, but it is still a full-on pattern, unashamedly so. That it what makes it quite wonderful. But it is not as bold as you might think. Because it is a small scale, albeit intricate, pattern, even using quite contrasting colours, as we have done here, does not make it overpowering. You have to see it to believe it which is why it was one of the first sets I chose to feature of our new stencils. I think this design is incredibly versatile. That is what I really like about this. It is actually quite neutral stylistically, works well with other patterns, and would make a great background in any interior. If we had to pick a stencil that has been a consistent best seller over the years regardless of any particular trend, it would be wording. There is something life affirming about a great quote, something you can see day in day out. Design wise, typography has merits. When you look at the letters as shapes, depending on the font they can be lovely, dramatic, spectacular, decorative and so on, just like any other design. But what makes wording special is that it has that added extra of actually saying something, be it witty, irreverent, encouraging, romantic or whatever you wish. We have a large lettering section. We do alphabet stencils so you can make your own phrase, custom phrasing in our "In Your Own Words" range and ready made proverbs stencils. Such is the popularity of the ready made proverbs, we have just added a few more wise words stencils. This is LD19 Sleep and it is part of our Proverbs & Quotations range. You can create art straight on your wall. It does not have to be a framed painting. This is handy for renters who are allowed to paint the walls (as long as they can be painted white at the end of tenancy) but are not allowed to put nails or the like in the walls to hang art. Some people do not like paintings but do like a bit of wall decor. And some people do not like the idea of an all-over pattern but want something to add focus to a room. These are all situations where the single large image can help. This is DE158 Panel No. 6 from our Art Nouveau range of stencils. It is the famous Peacock Skirt image by Aubrey Beardsley which was originally designed for Oscar Wilde's Salomé. In a prime position, stencils used in this way can carry a whole room. They can act as art, as a focal point, as enough decoration so that not much more is needed elsewhere aside from furniture and accessories or all of the above. Its been a funny old year. Not least in my garden. In celebration of the one glorious rose who has made an appearance so far this summer, I thought I would feature this abundant rose repeat stencil VN169 Roses, from our Vintage Range of stencils. My other roses will come out when they are ready, but it is quite a sight to see this one huge deep red rose open in amongst a sea of green leaves and buds. However, I digress. What is always in bloom is this stencil. It is based on our extremely popular multi-layered stencil CO1 Rose which is a single motif. We took that design and made it into a repeat pattern for those who wanted an all over wallpaper look without having to measure it out yourself. These multiple layer stencils are easy to use. They come with full instructions as to which shade to use on each layer (which are numbered so you know the order) to get a three dimensional realistic looking rose albeit one that is quite a bit larger than life. As a repeat this comes with guides on the stencil for accurate regimented layout. You can make them bold or subtle. Your roses can be in pale tonal shades that only slightly sit up from the background or you can make your roses a deep and rich red like my showoff single bloom. I have mentioned before that we try and find ways to turn ALL designs into stencils. With some, we have to get creative (more creative than usual). We especially love those that were previously thought impossible to make as a stencil design. In one way it is a compromise in order to get the design as a stencil (the alternative being some vastly more expensive type of decoration). But in another way, it is a whole different style with its own merits, possibly even better than the original. My previous post mentioned reverse stencils. This post is about using dots which enable us to make stencils of continuous linear based designs. It is a very decorative way to break up the line so the stencil holds together well. The alternative would be to simply break the line with a bridge every so often. Not only does this not look right (especially on curves) but it does not make a robust stencil overall for these types of designs. Using dots allows us to make some incredibly detailed and large stencils patterns. The first example, above, is our VN34 Ebb Tide repeat pattern from our Vintage Range of stencils. This pattern would be impossible as a line, especially as it has such an exaggerated wave shape. This one could definitely not exist as a stencil repeat in any other way. Swirls can be cut as lines, but the centres just drop out like the paper party decorations one used to make that hung from the ceiling so would be impossible to stencil repeatedly. This design, VN3 Klimtomania also from our Vintage Range, is large and very stable as a stencil even though it has several swirls on it. I like to think the dots add a bit extra to the design as well. Being curvy, the dots soften the design and to me enhance the effect. If you put "dots" into the search on our site, you will see all sorts of other fantastic stencils we have managed to create employing this method. To get a stencil to hold together, we add bridges. The easiest example I can use, is the letter O. If we did not add bridges to hold the centre in place, then it would just drop out. So this applies to any design that has shapes within shapes. We try and make the bridges as decorative as possible so they start to look like part of the design, but there is a limit to what can be done. Too many bridges can cut the design apart so much, it ceases to look like the original pattern. There are a few ways we can get around this and one of them is to make the stencil in reverse. This enables us to make stencils that previously would not be possible to make if we had to rely on bridges in the traditional sense. The end result is the same, but it requires the user to work backwards so to speak. Reverse stencils need you to paint the wall the colour you want the design to be, because you are then going to stencil in the background colour. In some cases, that doesn't make so much of a difference. For example, the elaborate VN32 Swirls pattern from our Vintage range of stencils shown above probably would look fine which ever way around you used your colours. In this case, the wall was painted pale grey and the stencilling (background) was done in dark grey. But with other reverse stencils, you have to think carefully about which way around you use your colours. This VN121 Lace stencil for example (also from our Vintage range). If you want pale pink lace, as done here, then paint your wall pale pink and do the stencilling in grey. Whilst this design will also look excellent as grey lace on a pale pink background, it will look very different and may not be what you want even though it is the same two colours. Here is another example of a reverse stencil done in tonal colours. In this case, the wall was painted the dark blue and the pale blue was stencilled. This is VN52 Leopard Skin from our Vintage Range. The design will look very different done the other way around. If you are undecided which way to go, I do recommend trying it both ways on a sample board before you hit the walls. You can also have fun with that and do both, swapping it on opposing walls for example. Whilst reverse stencils may require a bit more thought beforehand in terms of colour choice, they are no more difficult to do and this way, you are able to have pattern on your wall not previously achievable in a stencil. 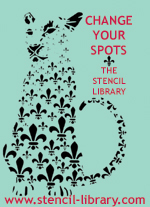 There are so many different ways you can use a stencil. We feature all over repeats and borders often because they are the most popular. But sometimes, they can be used as a simple accent to add a bit of interest to something rather than as a whole decorating feature. Here we have used a Japanese bird and blossom design from our Japanese range of stencils. It is JA114 Bird and Blossom No. 1 and it is a single arcing branch with birds and blossom on it. This is such a versatile design that can be used in so many ways because it is a nicely shaped, finite motif. It does not need to be repeated, but can be if wished. It works well on furniture, cushion covers or other fabrics, and as an accent on walls as shown here. It is placed to frame the settee in this case. If you want to really make a feature of something, you can enhance its presence with a bit of extra design so it can be practical as well. If you have something that looks a bit small in the space be it a picture, mirror or piece of furniture, adding a little extra stencilled decoration is surprisingly effective at increasing its size.